← Vegans Say What? : Do These Things Really Have Animal Products? If you are from the Northwest, have visited this time of year or have friends that live here you may be aware that we are currently in blackberry season. They grow in abundance and you are able to find them in random places like the side of the highways, most parks and in your own back yard. Having only lived in Seattle for the past four years my family loves blackberry season and can’t wait for them to ripen, however this love is not shared by many of our neighbors for those delicious blackberries are considered weeds. So much so that last year just before the huge patch ripened across the street from our house, the city came and tore them all out. We were heartbroken! This is an old recipe that my Oma use to make that my mom shared with me this weekend, veganized of course.Due to the ease of finding free blackberries this time of year they were my mom and my fruit of choice. You could replace the blackberries with a different type of berry if you like. I am usually not specific about products but in this one I have to be in order to get the right flavor my Oma always used a vanilla sugar that she would bring back from Europe. If you live in the US you may purchase it at Cost Plus or most likely other European deli/markets and it will most likely be Dr. Oetkers. The tartlets are best if cooked a day before in order to soften, otherwise they are hard and a bit difficult to eat but still delicious. Fill each tart with pudding. Top each tart with pudding. Arrange 1/4 cup blackberries over each one. Add sauce over the top when ready to serve. You will need 8 4″ tart pans (you could also make one large one). Preheat oven to 350 degrees. Mix above ingredients into a dough. Press dough into tart pans. The thinner the better. Bake until golden brown. In a convection oven it took 15 minutes in a regular oven it will take 20-25 minutes. Let cool and remove from pan. Cook blackberries and one cup water over medium heat and bring to a boil. Reduce to simmer and cook for five minutes. Strain, reserving liquid. In a sepearte cup mix 1/4 cup water and cornstarch and set aside. Add lemon and sugar to blackberry liquid and bring to a boil. Reduce heat to low and stir in cornstarch mixture. Cook for five more minutes. Let cool. You may use vanilla pudding of choice made according to package. You need at least one cup of pudding. We used Mori-Nu Mates Vanilla Low Fat Pudding Mix. 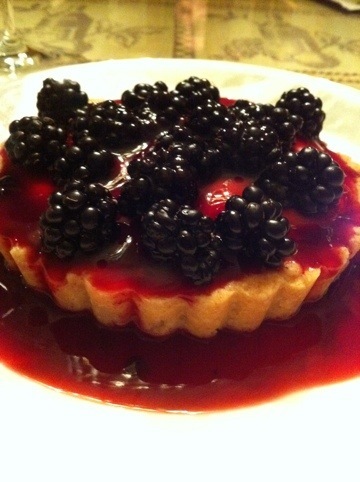 Gallery | This entry was posted in Anzia's picks-a young vegans perspective, dessert, Mom's Recipes. Bookmark the permalink. How could any of this be better stated? It coldun’t.